Jms queues are used for reliable messaging. In some scenarios requirement do come when we need to configure retry able Jms queues that means when something error out in transaction ,we want that it should retry the same message multiple times. Follow below steps to configure retry able Jms queue. - Go to your Jms queue. - Go to "Deliver Failure" tab. Redelivery Delay Override : Time interval between retries. It is in milliseconds. Redirect : redirect message to different queue. Log : log the message. Discard : discard message and it will be lost. Error Destination: If you choose "Redirect" then choose the queue to which you want to redirect message. Hi, what version is this WLS as I couldn't find this setting page in my console? I am using 10.3.6.0 version. Thanks for the post. After putting the message into ErrorQueue, how can we reporecess it. 1. Do I need to create a separate proxy which will pick-up the message from ErrorQueue and will put back into the Inbound Queue.? 2. 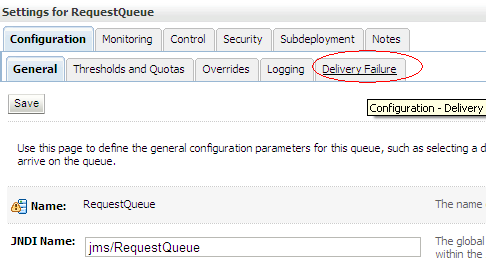 Can configure same redirect back to Original queue for Error Queue. You need to create a separate service which pick the message from error queue and put it to inbound queue. Thanks Vivek for your quick reply. I will try the same. befor to start I apologize for the delay in my aswer, then, thanks for the post, it was a great help, however I have a requeriment with a little difference scenario, in my case, I need to pick the message from error queue on demand, I mean, I would need to activate the separate service manually, for example, executing the proxy manually (maybe expose it as rest service) that it will read the message from Error Queue and will put the message to the Inbound Queue for reprocess it. My question is, How can I do this? I understand that once I create the proxy that which will pickup the message from ErrorQueue automatically will read all the message that are in it, that's true?. I hope I have been clear. Sorry my horrible english, I'm from Argentina. 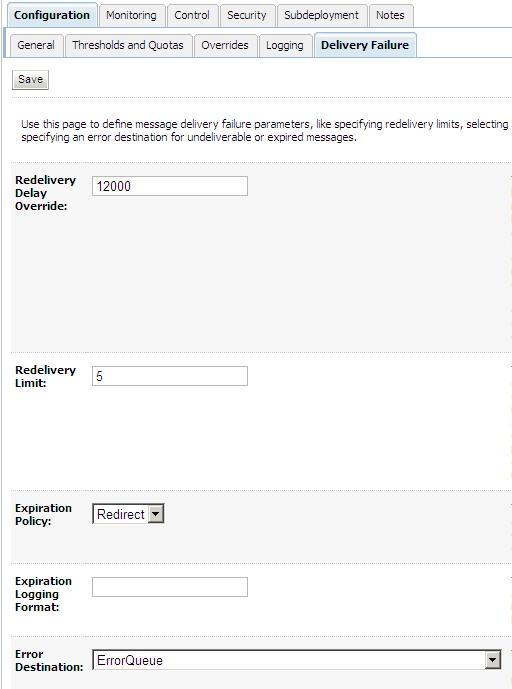 In the expiration policy if you select Log option then where it will log the message. Along with logging can we notify also. I don't think notification option is there when we choose to log the message. But where we can see the Log message details. Can you please give some information. Adding to above scenario, which will be the best possible approach for retry mechanism. I already mentioned best approach for retry mechanism in the post. You can retry as per requirement and send the message to error queue. Now it is up to you, how you handle the message which is there in error queue. You can create a separate service which will pick the message from this error queue and you can add required logic in that service. Thanks Vivek. The post talks more of QoS, how routing options work in this case ? I have dilemma between routing options with error handler reply action and JMS queue redelivery options to make sure message is delivered.